The appearance of another icon, Stegosaurus in the news this last week prompted me to try and see which of the two patterns it fits. It’s newsworthiness comes from the display of one of the most complete skeletons in London’s Natural History Museum, and my interest stems from its primal role in exciting my interest in zoology back in 1957, when I saw Fantasia. 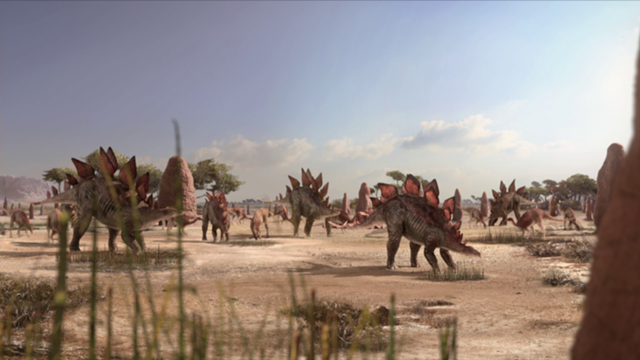 The Stegosaurus is one dinosaur that was so widespread that quite a few specimens have been discovered and enabled further discovery and investigation of this large herbivore. Several specimens of the Stegosaurus sub-family have also been found in Western China, considered by some to be from genus Stegosaurus itself. And indeed the current opinion is that the worldwide material is best explained by just three definite species, and one dubious one. So as with Tyrannosaurus, Equus and the other taxa I looked at in my 2013 piece, the pattern is once more of many specimens of just a handful of species. There is no more support for Darwin’s gradualism in this part of the fossil record than Darwin was able to find in any other part of it back in 1859. Once again, the evolution is happening somewhere else, below the resolution of a fossil record. But paradoxically a chosen few species fossilize commonly (relatively) across wide geographical spaces and broad geological timespans. Does this mean it’s better to assume gradualism from the lack of evidence and treat the abundance of certain species as a fortuitous rule? Or does it mean there is evidence for long stasis and relatively sudden change as the common pattern of macro-evolution?